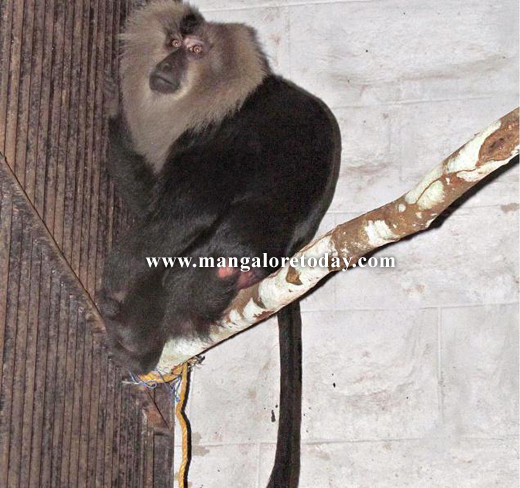 Mangaluru, Jan 22, 2016 : According to H. Jayaprakash Bhandary, director of the park, A pair of lion-tailed macaque will be an added attraction at the Pilikula Biological Park soon. Though this critically endangered species of the Western Ghats have been brought to the park to be in captivity, they will be sent to the display enclosure only after a week or so. He said that the pair, a male and a female, been brought from Parassinikkadavu Snake Park in Kerala on the instruction from the Central Zoo Authority of India. The macaque has silver-white mane and black hair. Bhandary said that the destruction of evergreen forests and hunting for meat have made lion-tailed macaque critically endangered species of the Western Ghats. Now, some of them are noticed in the Kudremukh, Agumbe, Sirsi and Silent Valley belt (Kerala) in the Western Ghats. They live in groups at a height. Their lifespan in the wild is normally 20 years. But in captivity they live more. Their gestation period is about six months, he said. The pair is now under quarantine at the park to allow them to adjust to the new environs before going on public view.